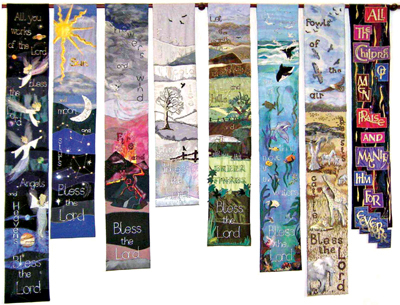 The Benedicite, one of the traditional Canticles in the Prayer book in praise of creation, inspired this set of hangings. Backgrounds of numbers 1-5 were constructed by stitching together horizontal bands of fabric – velvets, satins etc. Designs were applied using different techniques, including hand embroidery. The background of number 6 was hand painted on cotton. Number 7 was hand painted and stitched on canvas. The animals and birds (number 7) were hand painted using fabric paint, padded, stitched and cut out before being applied. The background for number 8 was constructed using vertical bands of velvet and gold fabric, designed to take the eye upward in praise. Ribbon embroidery was used for the lettering. The word ‘Ever’ extends beyond the edge to indicate that the praise of God cannot be contained within the confines of a banner.